Stanghow Lane County Modern School, 1959? First year at Stanghow Lane in 1959? Assistance with names and date, please? Back row: Harry Craig, Philip Metcalfe, Brian Dale, Stephen Bunker, Steven Laker, Jeff Bales, Les Johnson, Alan Scott. Third row: Michael Hudson, Ian Turnbull, Kevin Drinkhall, Neil Drury, Jeff Coates, John Carter, John Hannah, Joe Bannister. Second row: Dennis Housam, Tina Scott, Betty Agar?, Sheila Riddiough, Anthea Dunn, Wendy Holmes, Felicity Holmes, Barbara Green, Felicity Staward, ? ?, Michael Crame. First row: Kathleen Laker, ? ?, Pauline Thirling, ??, ? 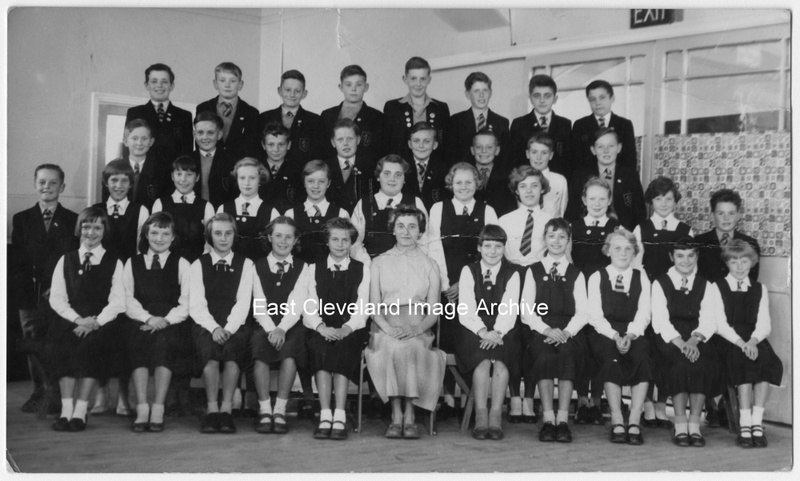 ?, Mrs Margaret Scott (Teacher), Caroline Batterbee, Susan Jessop, Jean Whiteley, Norma Readman, V Taylor. Image and some names courtesy of John G. Hannah, also thanks to Dennis Housam (via Jennifer) and Brian Hamilton-Dale for the updates on names. 2 comments to Stanghow Lane County Modern School, 1959? Dennis (my husband) said its Jean Whiteley not Susan and the boys at the back are left to right Harry Craig and Philip Metcalfe and the boys at the other end are Les Johnson and Alan Scott. The girl next to Tina Scott is Betty Agar. The girl front row on the left is Kathleen Laker. 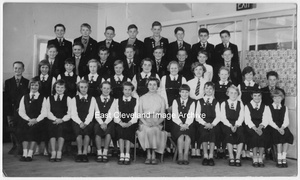 Dennis remembers Happy Days at Stanghow Lane School.